In Financial Bull Riding I wrote that annual percentage returns is the wrong measure of investment performance. The better metric is absolute dollar return. Naive investors, and most financial journalists, assume the two will produce the same results, but they don't. 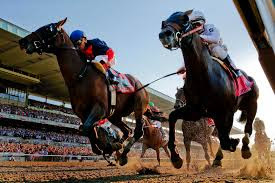 Almost all of Wall Street is geared around this idea of a horserace. That it’s all about trying to beat your benchmark, beat the S&P 500 — to do it every quarter regardless of whether that quarter is up or down. That’s not what most people are looking to do. That’s only how money managers evaluate each other, maybe. But that’s not necessarily what’s going to serve the actual financial requirements or financial needs of people who are out there. The biggest demand out there is for income and it’s not just because interest rates are low, it’s because baby-boomers are retiring and most of them don’t have those defined benefit pension plans to count on. I said more than 10 years ago that I’m not trying to beat the market. Don’t expect me to try and beat the market every year. Since then, we’ve only beaten the S&P 500, 4 out of the 10 years. But, cumulatively, we’ve out-performed the S&P by I think it was 9.4 percent annualized return to 7.6 percent for the S&P over the same time. Conventional financial advise urges people to bet on the horses, those companies whose stock prices will soar in the future. At retirement, investors will need to sell enough shares to meet livings expenses. The problem with living off the pile (once you go into withdrawal mode) is that it’s dollar cost averaging in reverse. When the market plunges as it does from time to time, all of a sudden you’re selling off a large number of shares to meet even small withdrawals. You’re eating through the principle value, the capital value of your portfolio very quickly to try to maintain your lifestyle. But there is a problem with depending on dividends. The S&P 500 yields just 2 percent right now. Even with $1 million, the income would be a mere $20,000 per year, a poor supplement to Social Security. And a retired person wouldn't want to consume all of his yield because he would want to leave some behind to make up for the erosion of wealth caused by inflation. Peters improves his income from yield by investing in companies that pay at least a yield of 4% and increases dividend payouts each year. Even better would be to combine Peter's dividend investing with the timing strategy of Ben Stein's book, Yes, You Can Time the Market. Stein employed a long term moving average of 15 years and recommended buying stocks only when the market is below the average while piling up cash when the market is above. That way the investor would have cash to buy more stocks when the price fell below the moving average. Stein used a 15 year moving average because he was working with annual data. Most investor relying on monthly or quarterly data will find 7 to 10 year moving averages more effective. The beauty of Stein's strategy lies in the fact that when the market is below the long term moving average yields will be at their highest. That's because stock prices fall as much as 50% while good companies try not to reduce dividends during recessions and bear markets. If an investor only buys good dividend paying stocks during recessions, she will lock in yields of as much as 10%. That yield could grow as good companies increase dividends over the years. She might be earning a yield of 20% after a decade. The principle is similar to one that has made a lot of people rich in real estate. They bought houses or apartments to rent. In the first few years the rental income just barely covered expenses, but after a decade of increases in rent the yield became very attractive while the property has increased in value due to inflation. I have zero weight in tech ( which is the biggest sector of the S&P 500) because I just can’t find companies that I really have a lot of confidence both in their capital allocation practices, their dividend policies. And their ability to maintain their businesses, their earnings power and cash flow indefinitely into the future when things change so much. My basic screen is dividend yields over 3 percent. That’s not to say that I’m not occasionally willing to make an exception and go a little bit lower if there’s a lot of growth. They’re either cyclical businesses that can’t really control their costs or what they’re able to charge for their products. But if you want to be a buyer of a cyclical business like this, I think you want to pay a pretty good discount. Investors save primarily for retirement, the time when they quit saving and start spending. They can spend by eating their nest egg or by following Peters' advice they can have their nest egg produce income to consume. Holding quality dividend paying stocks for a decade or two can greatly increase the yield on the base investment regardless of what the S&P 500 does. The only other option is to write options covered by the nest egg, but that will greatly increase stress during retirement.